‘Accentuate the Positive’ is a show devised by me and director Jason Cannon, about living with HIV/AIDS. Originally performed in New York City in June 2011, it was an unsentimental look at the disease through song, focusing not on remembrance but on looking forward. It celebrated the lives of the survivors and told new stories about prevention, treatment and living with the disease. We worked with NYC community partners including aidforaids.org, GMHC and CHEST, to ensure real authenticity. It was such a success that we decided to take it to the 2012 GALA Festival in Denver. I was also Artistic Director of ‘Big Gay Sing Denver’, our Singalong show to two sell-out audiences of 2500 LGBT singers. 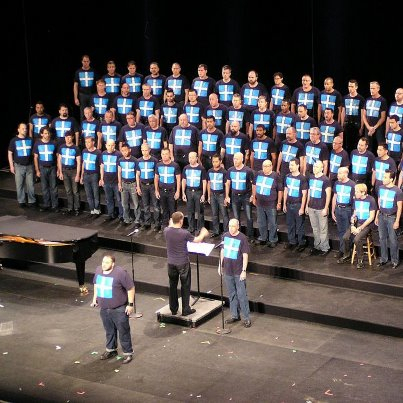 The 300 strong chorus on stage were made up of five choirs: NYCGMC, Seattle Women’s Chorus, Gay Men’s Chorus of Charlotte, Reveille Men’s Chorus and Men Alive, The Orange County Gay Men’s Chorus. “In our moment of real triumph, I want to share with chorus members not at Denver that something very special has just happened. I am not one to use hyperbole. But for those not at GALA, the audience response to ATP was really extra-ordinary. There was much emotion, many tears in the hall. All of us have been talking about the slightly surreal experience of walking the streets of Denver in ATP T-shirts after the show and being stopped like celebrities again and again, by people saying how great the show was, how they cried, how we had told their stories. And Big Gay Sing Denver last night was truly spectacular! Before we even started the second show, the massive 2500 seater hall was packed with people dancing and singing in their seats. Much drag, bears in the side boxes bare-chested, and the entire group were doing dance routines, clapping and cheering along with the DJ. In the show itself, energy was unique, highly charged and very NYCGMC. They stood, held hands, swayed from side to side and everyone sang. Personally, I am going to remember the incredible sound of the huge audience singing 'You Raise me up' along with James and the massed chorus for a long time. We have just completed an incredible journey, and one that has had real impact on people’s lives. I know I made heavy demands on many parts of the organization - artistically, logistically and financially. It was a risk, that you all supported me on, and I am truly grateful for everyone's contributions and sacrifice. We are an amazing team and a singing ensemble of quality! Much to be proud of. Thank you all.